No parking board advertising is noticed not only by the residents of the building, but also by-standers and people just passing by. Parking board advertising generates curiosity in the minds of on-lookers, and your brand stays in their mind at conscious as well as sub conscious level. Parking sign board advertising is an advertisement done on the society gate. No Parking Boards Advertising is a very cost effective type of advertising. No Parking Boards acts as a welcome agent for any society and greets every resident and non-resident of the locality. No parking board advertising through sign boards leads to better visibility which leads to-better branding, which leads to better sales. If you want a steady inflow of buyers, `No Parking` Board Advertisements and No Parking Sign Board Creation is just the right thing for you. With advertising options on the extremely common `No Parking` sign boards in residential and commercial complexes, reach out to potential buyers, right at their literal doorstep! Parking board advertising are not just restricted to major metros alone, almost all cities are slowly but surely grabbing to the idea of the no parking advertisements opportunities. Parking board Advertising are widely used choice for advertisers these days. Longevity, ease of installation and general acceptability plays a vital role in their proliferation in Tier-I, Tier-II & Tier-III cities in India. There is increase in compliance among riders for these boards as they speak to them right on to the face. Almost all notice boards you will see will have at least 30% of print area dedicated to the advertiser’s message, name, contact details, etc. and rest for the No Parking boards. Many times absence of parking sign board advertising act as a harboring area for riders. Sun pack sheets comes in different colors thereby giving the more choice to end user to select the appropriate background color. Sun pack sheets are also known as plastic corrugated sheets. Advertisers offer 1,2,3 or multi-color screen printing on these sheets. Cost, ease of installation, light weight is some benefits of sun pack. Parking sign board advertising costing is depend upon the size, type of board and your design artwork. Prismatic Sheets are weather resistant, durable, with higher luminescence. These are UV protected sheets with long sight distance viewing. Tin-sheets is traditional choice among advertisers as far as no parking board goes, as they are robust, thick and weather proof. Advertisers also use offset printing. They are finding an acceptance as parking sign board advertising because of their brilliant night viewing. Reflective sheets are water resistant, highly durable with all-weather visibility. They are also maintenance free. Reflective sheets are reflective sheets most commonly seen as sign board on roads, trees etc. Solar parking sign board requires just few hours of sunlight. LED Signage an expensive choice, which often used to target affluent and premium target segments. Regardless to say LED display stands out in comparison to the other options. No parking sign in india has been well accepted for innovative advertising. Advertisers, who have well understood the importance of no parking board advertising – which comes under BTL outdoor, low investment promotional medium. Parking board advertising`s unique positioning at eye level, makes it easy to see for every person either driving in or simply walking by the complex gate, thus promising a guaranteed high visibility. Parking board advertising are economical and cost-effective, making them a preferred choice for outdoor marketing. Parking sign board advertising are long lasting since they are water-resistant and sunlight proof. Since these boards are made of eco-friendly sun pack material they are not harmful to environment. No parking board advertising is durable and long lasting mode of outdoor advertising, it attracts only one-time-investment. 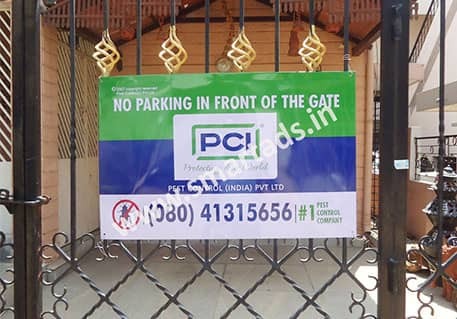 No parking sign in India can be designed to look extremely attractive, attention grabbing and pleasant to look at, thereby making them appealing and acceptable to everyone. No parking board advertising gives long lasting brand identity. Thus, parking sign board advertising is an effective mode of creating brand awareness and easy recall. 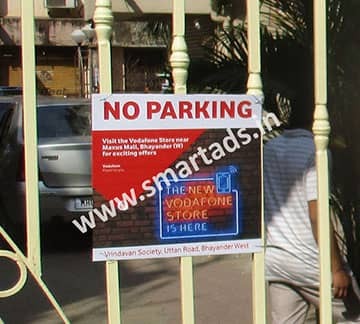 No parking sign in India is remarkable advertising method and it has been adopted successfully by many of our clients. Realizing no parking board advertising`s high impact and cost- effectiveness many private and public organisations have achieved good returns from using this simple and cost-effective advertising tool. Parking sign board advertising could be a great marketing asset which does not require a long term involvement or a large budget. No parking board advertising is a low-risk, high-return investment which can get your brand due recognition from people all across. Integrating no parking board advertising with other advertising medium can help you notch up good results for your marketing plans. No Parking Board Advertising in Mumbai. No Parking Board Advertising in Delhi. No Parking Board Advertising in Kolkata. No Parking Board Advertising in Bangalore. No Parking Board Advertising in Ahemdabad. No Parking Board Advertising in Surat. No Parking Board Advertising in Pune. Parking board Advertising in Mumbai. Parking board Advertising in Delhi. Parking board Advertising in Kolkata. Parking board Advertising in Bangalore. Parking board Advertising in Ahemdabad. Parking board Advertising in Surat. Parking board Advertising in Pune. Parking Sign Board Advertising in Mumbai. Parking Sign Board Advertising in Delhi. Parking Sign Board Advertising in Kolkata. Parking Sign Board Advertising in Bangalore. Parking Sign Board Advertising in Ahemdabad. Parking Sign Board Advertising in Surat. Parking Sign Board Advertising in Pune.